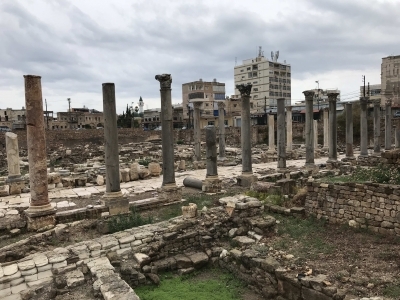 Tyre was the largest mercantile city of the Phoenicians, now mostly noted for the archeological remains of its Roman city and medieval constructions of the Crusaders. In its commercial heyday the people of Tyre founded colonies from Greece to Carthage and Cadiz. It is the legendary birthplace of Europa and Elissa (Dido). Tyre was founded around 2750 BC according to Herodotus. It reached its zenith from 1000 BC, as the commerce of the ancient world is said to have been gathered into the warehouses of Tyre. The city was particularly known for the production of a rare and extraordinarily expensive sort of purple dye, produced from the murex shellfish, known as Tyrian purple. The city over the ages saw Greek, Roman, Byzantine, Arab, Crusader and Mameluk conquerors. This is the third Lebanese WHS displaying mainly Roman remains. And there is another one (Anjar) heavily influenced by Roman architecture. It does not make me feel very happy that I still 'have to' check out dozens more of them around the Mediterranean - in Algeria, Tunisia, Libya for example. Roman remains have withstood the test of times so much better than that of other civilizations, so it seems. I visited Tyre on a day trip by public transport from Beirut. Although it is only 80km away, the bus took about 2 hours (including a change at Sidon). Tyre lies south of the Litani river, which means that is in the former danger zone between Lebanon and Israel. UNIFIL troops in their white tanks still patrol the streets. There is some ostentatious flag waving and billboards with political/religious leaders going on, but nothing too aggressive. I only saw my first billboard featuring the head of Ayatollah Khomeini, and a medical clinic named after him. Daily life in the streets of Tyre is as laid back as anywhere in Lebanon. I started my sightseeing at the Al-Mina ruins in the center of town. I was the only visitor. The site consists primarily of rows and more rows of columns. After about 15 minutes you have seen it all. Then it's a further walk of about 20 minutes to get to the other archeological site, Al-Bass, at the edge of town. You can see the hippodrome from afar, but unfortunately the entrance is on the other side of the complex. I arrived at the same moment as two busloads of schoolchildren, so this was not an as quiet experience. Al-Bass covers a quite extensive area, starting with a messy necropolis dotted with Byzantine mosaics. After that you end up with the almost completely restored and gigantic triumphal arch. And then there is the vast hippodrome, quite a hike to do a full loop there in the blazing sun. Although I was a bit fed up with Roman sites at the start, I must say I was impressed by the scale of this site and keeping in mind the notion how far this is from Rome. Tyre is an easy hour and a half hour drive south from Beirut. Many official travel advice recommend against travelling to this part of Lebanon, but the southern border is peaceful now and though the area looks a bit rough around the edges, the double site is very nice. We started with the Al Baas site with ruins of a Roman hippodrome, tombs with holes dug out probably by grave robbers, large cobbled route with a lovely arch. And outside it, a bit of a dishevelled town that makes it really interesting. There's a museum on site, but it's in a process of a very gradual restoration, with no info when it's going to be ready for visitors. To get some information on the site, just read your tour guides before the visit or buy a booklet from the ticket office. There's a parking on-site and the entrance is a bit inconspicuous, so just trust your online maps. The second site is Al Mina about three kilometres away in a residential area. There is a street across the entrance, we found parking spot easily there. On site are loads of columns, a lovely views of the sea with a submerged harbour. There's also some kind of large rectangular space that we read was apparently an arena for water sports. And a couple of mosaics, but don't expect Old Paphos or Villa Romana. A nice visit we finished by stopping at Sidon by the Crusader castle (there's loads of restaurants opposite it, if you have trouble parking, go to Zawat, they have vallet parking for customers and were very cool with us going for a short visit to the castle after our lunch). There are a few sites where if you want to visit, timing is important. Tyre is one of these sites because its so close to the Lebanese Israel border and comes into play during any conflict. Its no secret that Hezbollah (Party of God) controls this part of Southern Lebanon and often the region is close to travel. After the last conflict with Israel in 2006, Southern Lebanon was closed to tourists for a few years due to dangers from unexploded ordinance and the roads being bombed out. Nonetheless, the situation has calmed down and there is a window of opportunity and I made it there last month in April 2010. The drive down the coast is so pretty and idyllic but you know immediately when you are close to Tyre because the roads would be lined with the Hezbollah yellow flags and there are banners of Iranian mullahs everywhere. Also you see many UN troops in their blue helmets guarding intersections. Beyond those signs, everything else seems perfectly normal. In fact when we had lunch in a seaside inn, the owner encouraged us to return in the evening because he transforms the dining area into a bar with rock music etc. Not as conservative as you would expect. Tyre was founded by the Phoenicians and they prospered as sea faring traders. The commerce that made Tyre famous was that they could harvest a certain seashell called Murex that produced a purple dye used by royalty across the Mediterranean. Unfortunately it takes 10,000 shells to produce 1 gram of dye and the Romans and to pay for it with 3X its weight in gold. Not surprisingly, the shells were over harvested and the industry went away. Aside from the Hippodrome, there is a wonderful necropolis that should not be missed. Its a little morbid but the necropolis is in great shape and there are so many forms of burial that you can see. There are many stone sarcophagi with carvings, columbaria with multiple chambers etc. Hopefully peace and prosperity continues in Lebanon and tourism flourishes, but in this part of the world its always volatile. So go when you can. 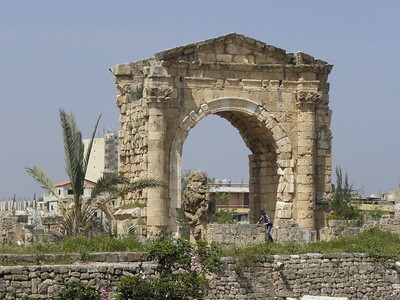 Tyre is an ancient town whose history is known from around 2700BCE. In particular it was an earlier home of the Phoenicians and it was from there that they set out to found Carthage. Today it is a modern Mediterranean city surrounded by 3 large archaeological sites with remains covering Phoenician, Greek, Roman, Byzantine and+ Crusader periods. Most of the remains are at around ground level with the odd pillar and it is difficult to make out a great deal from the confusing jumble of stones. This is no Baalbek or Palmyra with huge ruined buildings. One site does however merit a special visit if you are passing by – the Roman Hippodrome (photo). It has been partly reconstructed and is said to have been used for the chariot scenes in the film “Ben Hur”! Umayyad Caliphate: Carried out restoration and fortification works in the seaport of Tyre. Ibn Battuta: "For sheer masonry there is no more marvelous or more remarkable construction in any town in the world; for the sea surrounds it on three sides and on the fourth side is a wall underneath which ships may enter and come to anchor." Shakespearean plays: Pericles, Prince of Tyre - "Tyre -a room in the Palace"
Incorrect UNESCO 'Number of locations': No of locations not clear. The "Reactive Monitoring Mission" of 2012 had considerable difficulty in establishing boundaries for the property using documentation provided from the time of inscription onwards. The UNESCO Web site description makes it clear however that there are at least 2 separate inscribed areas "In the modern town of Soûr, the property consists of two distinct sites: the one of the town, on the headland, and the one of the Necropolis of El Bass, on the continent."